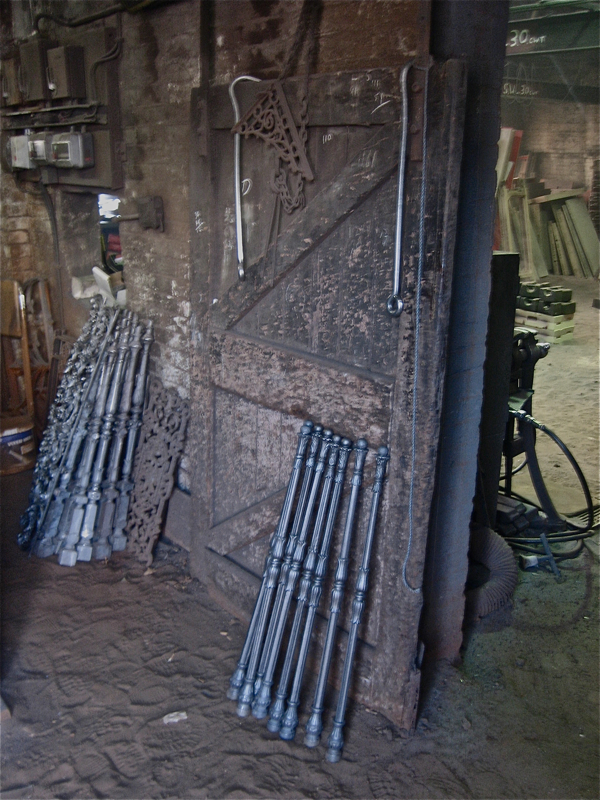 So there we were together, standing in the stillness of a shaft of sunlight upon the sandy floor of the old foundry, enjoying this brief moment of peace when the work was done and contemplating the achievement of the past week, manifest in the castings of iron stair rods laid out in front of us. Already my suspicion was that Brian was a little unconvincing in his reluctance to anticipate next week but as I did not wish cloud his satisfaction, I simply asked if he was finished for this week. “I shall come in on Saturday for a few hours,” he confirmed with a placid smile through his straggly beard, just to reassure me that his job was no ordeal. 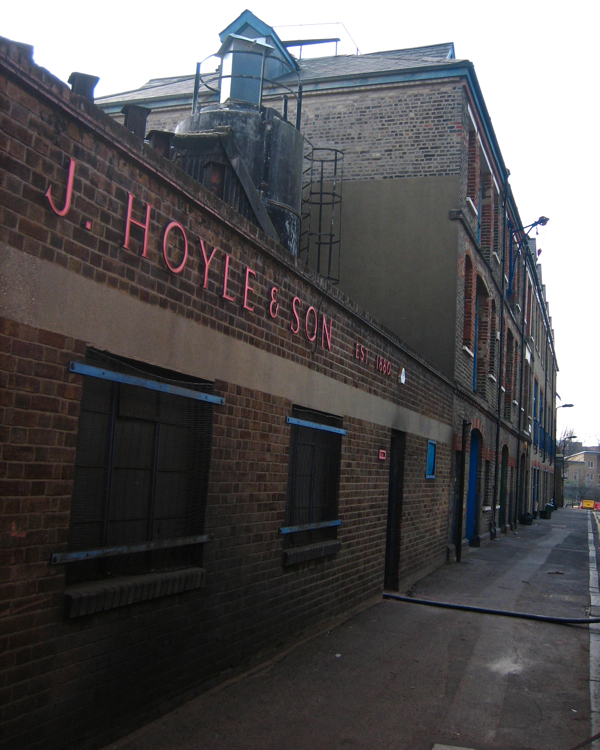 In this venerable brick building beside the canal glimmers the spirit of the Industrial Revolution and even earlier – because iron casting is one of the oldest technologies known to man – and at J.Hoyle & Son the essentials have not altered since they set up in 1880, as one of the many small foundries that operated in the East End at that time. Ironwork cast here at J.Hoyle & Son (the Beehive Foundry) can be seen upon The National Portrait Gallery, The British Museum, The Houses of Parliament, 10 Downing Street, The Bank of England, The Natural History Museum, and Smithfield Meat Market – as well as the lamp posts along the Chelsea Embankment. 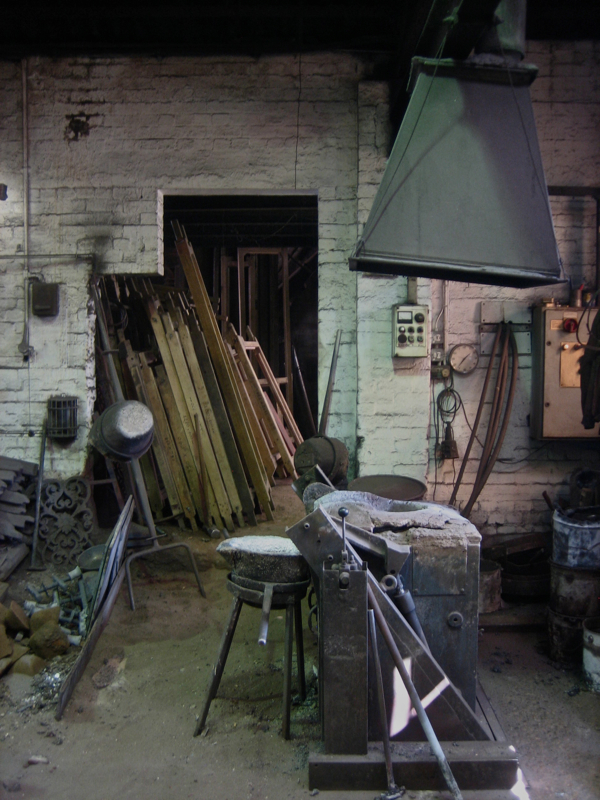 On every occasion I have passed, I have caught a fleeting glimpse from the street into the hazy dim interior of this foundry, a place of dusty old equipment and raw creation, containing both the dark furnace of William Blake’s Jerusalem and the chiaroscuro familiar from the paintings of Joseph Wright of Derby. 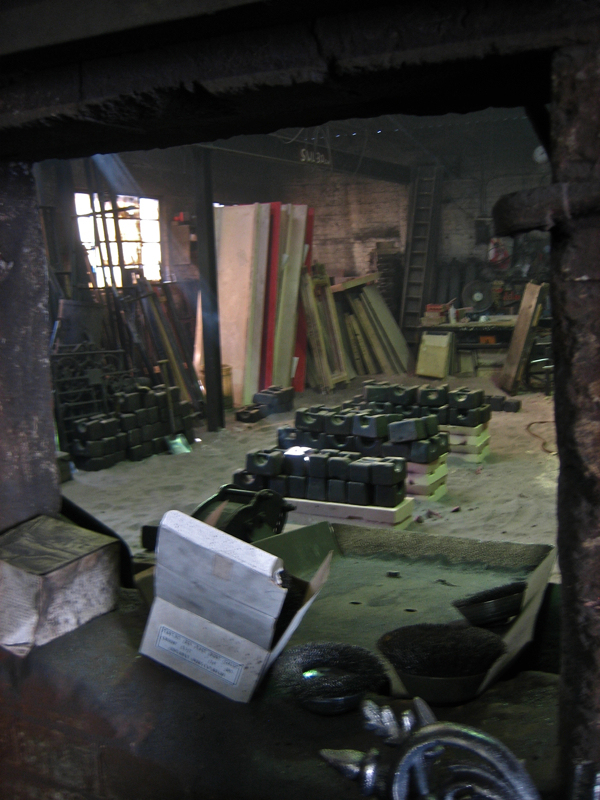 My father was apprenticed at a foundry at the age of twelve, yet I had never been inside a foundry and all this time I have carried a burning curiosity to get into one of these places. 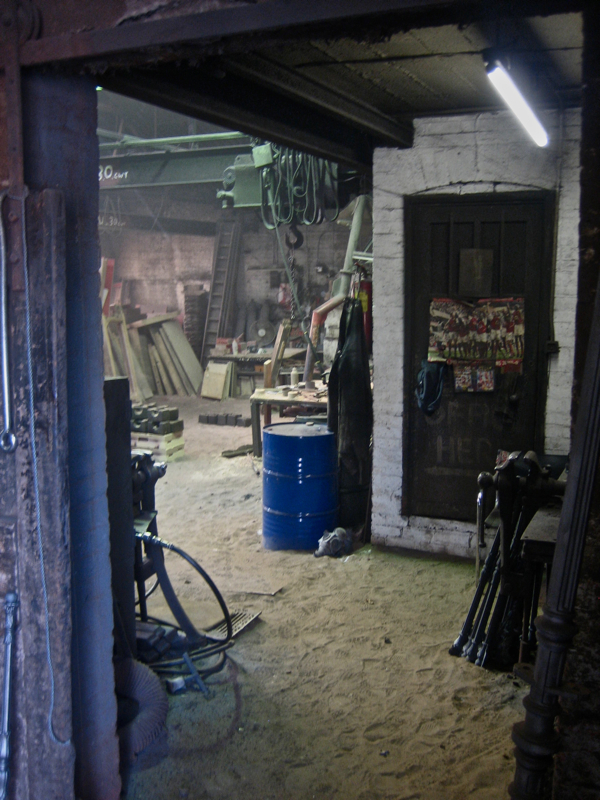 So it was a vivid and emotional moment for me when I stepped through the threshold in the twentieth century facade of J.Hoyle & Son into the vast darkness of the nineteenth century foundry beyond. 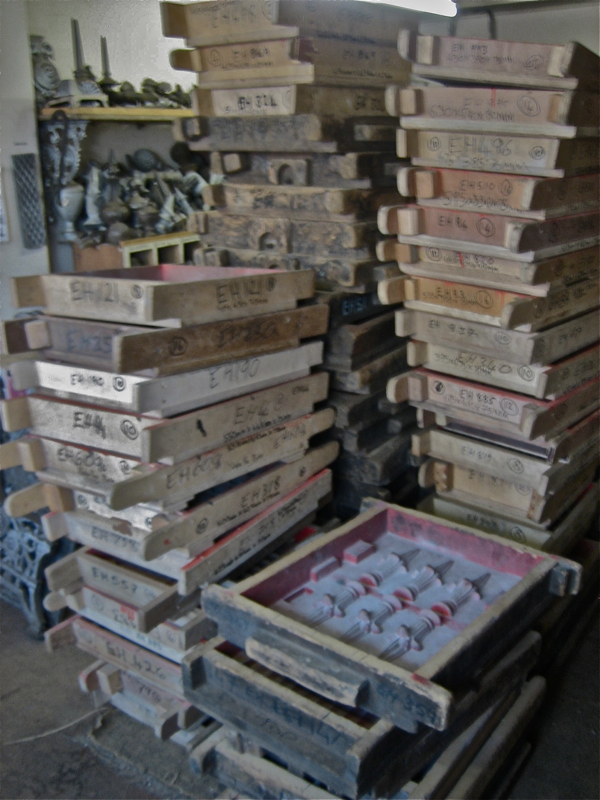 Everything was encrusted with black sand, settled like ash, as if I was in the proximity of a volcano, and there was an intense metallic smell – which I learnt was formaldehyde used to set the moulds – that filled the lungs. And after a lifetime of expectation, it was a privilege to be welcomed by Brian, the limber and sinewy custodian in his proud lair, to this environment that is so alien to the city street outside yet strangely reassuring to me. Today, Alan Hoyle runs the business founded by his grandfather John Hoyle and now Brian his foreman is training Ben Hoyle, twenty-one years old and the fourth generation in waiting, as a general apprentice in all areas of foundry practice. 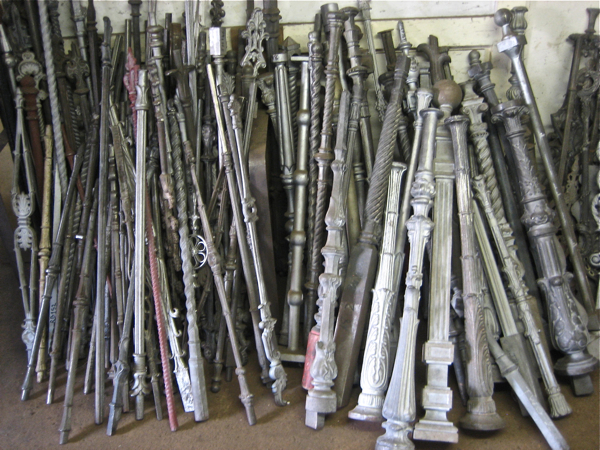 Hoyle & Son own an enormous pattern book that allows them to match almost any historic railing or piece of ironwork to replace it, receiving business from restoration projects nationwide and giving Brian with a continuous stream of intriguing project, both casting and repairs, to fill his days. 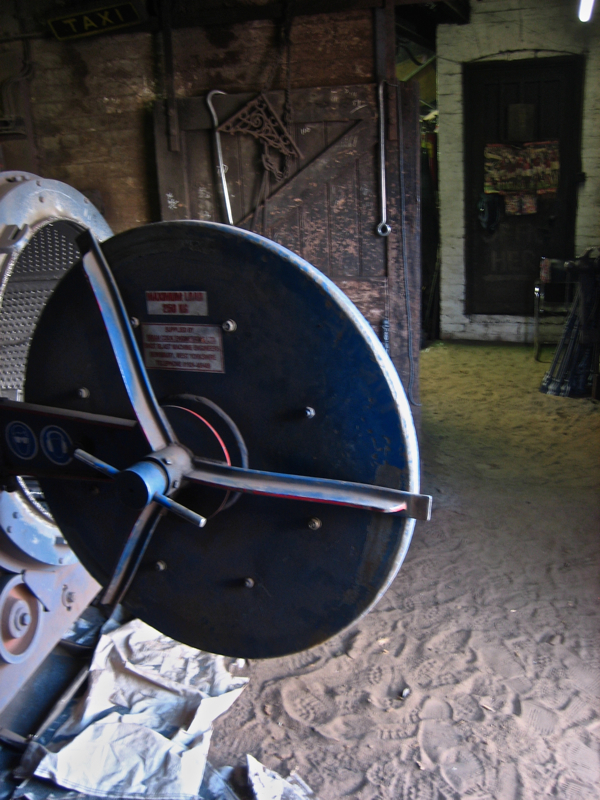 As the foreman with a team of seven, Brian runs holds the responsibility of running the furnace, taking the pig iron that you see piled up by the door and heating it to thirteen hundred degrees ready for pouring. 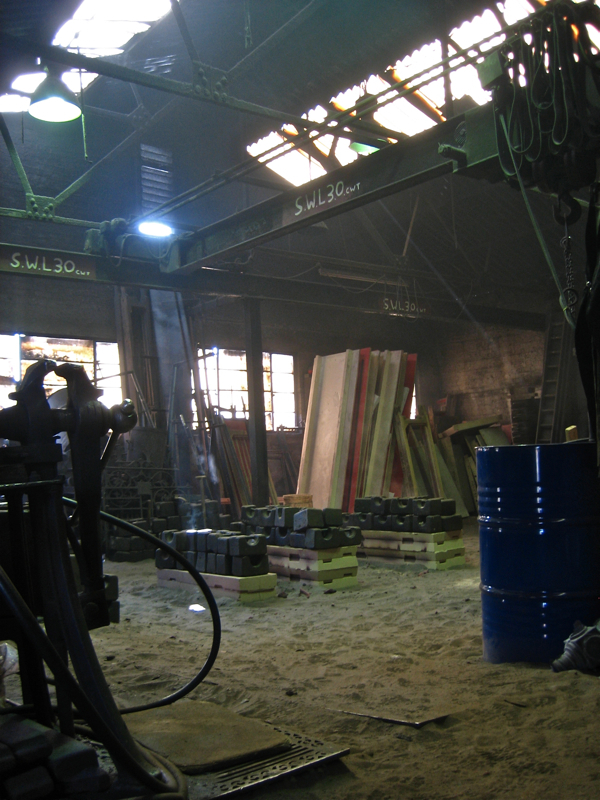 “You make a lot of friends if you’re working the furnace in the Winter.” he quipped sagely, referring to the ever-open foundry doors that bring in the Spring breezes now but render the workplace less sympathetic in January. 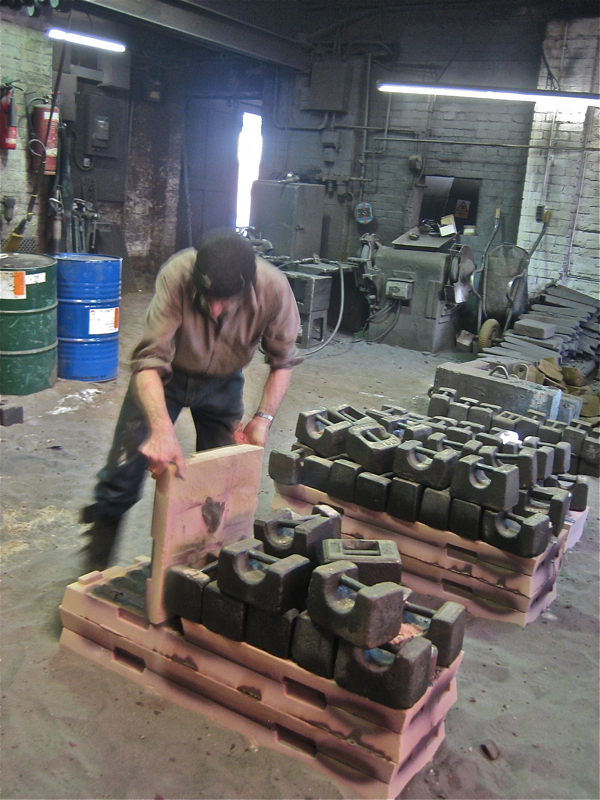 “Estuary Iron” is often used these days which contains graphite and is tougher and less brittle than conventional cast iron. 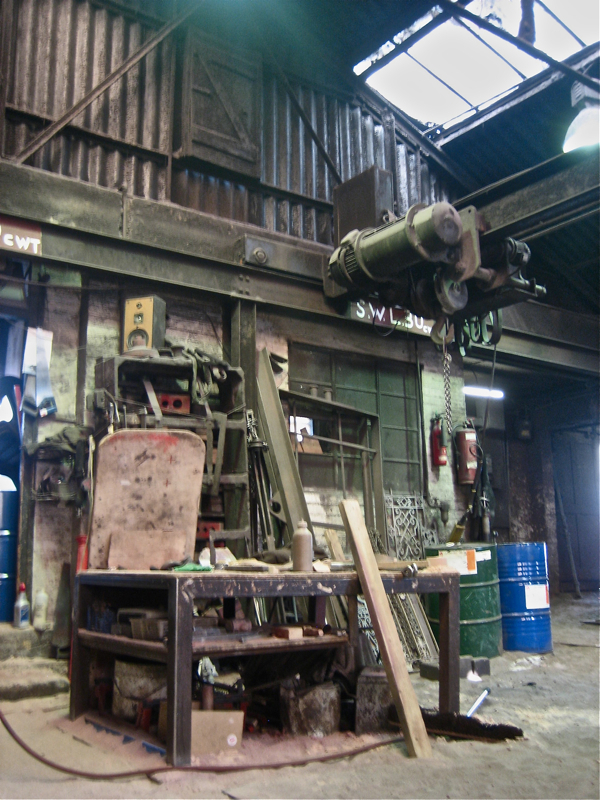 Another modern intervention is the vast computerised sand pump, towering over the foundry, that can pump eight tonnes of sand an hour, mixed with resin to make the moulds for casting. “We used to work with damp black sand, but this combination allows us to get better detail,” explained Brian. 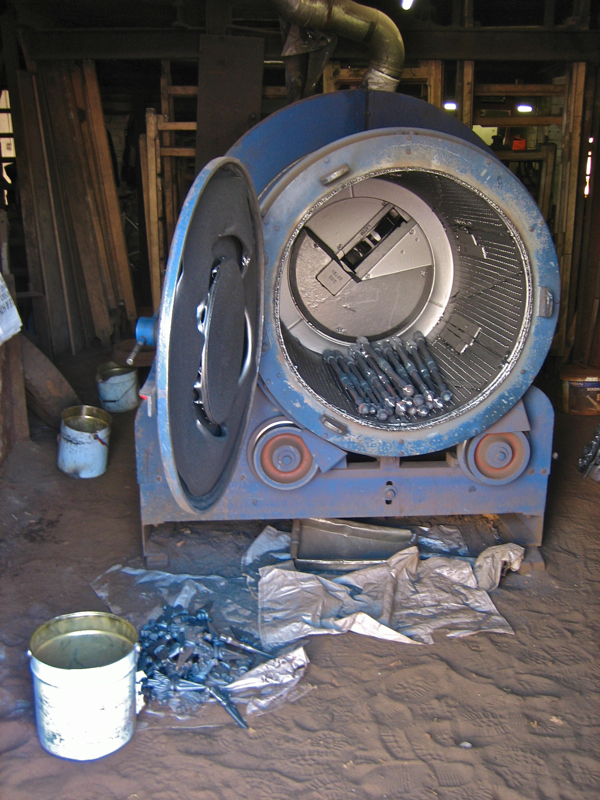 Once the casts are cracked out of the moulds, they are put into the shop blaster – a bizarre variant upon a tumble dryer, that fires steel shot at the rotating pieces of iron to remove scraps and clean up the shape. I was inspired to see this foundry work continuing in time-honoured fashion and know that no piece of railing or fence need ever be irreparable, thanks to the talents of Brian and the team at J.Hoyle & Son. “No-one likes getting their hands dirty, do they?” asked Brian rhetorically, displaying his grimy paws to me when I offered my hand to shake his. Yet although for generations white collar jobs have been widely perceived as superior to blue collar employment, and my father spoke of his apprenticeship in vaguely apologetic terms, it is obvious that there can be dignity and fulfilment in manual work – such as here at this foundry – requiring real skill and accomplishment. Brian’s hands looked like my father’s hands, lined with ingrained dirt, which I remember from my childhood and that magically renewed after his retirement, as if he had worked at a desk his whole life. 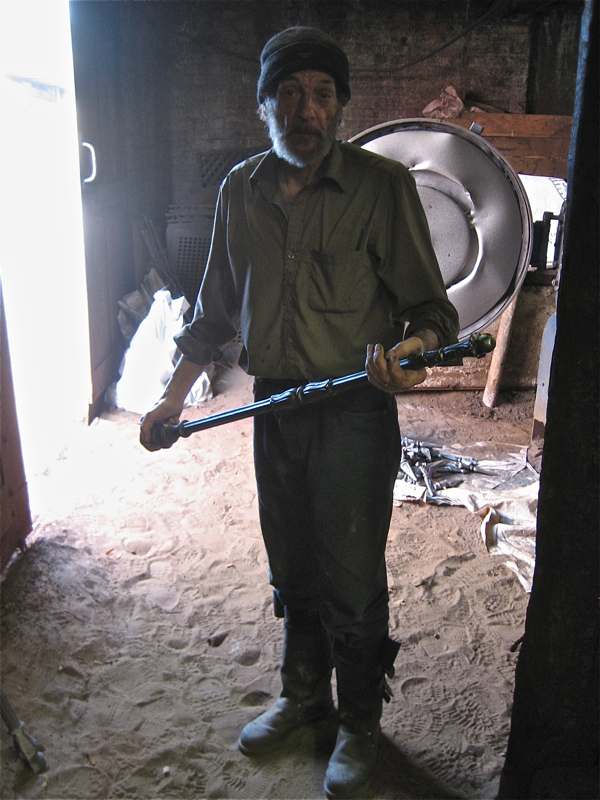 I am proud and a little envious that my father undertook an apprenticeship in a foundry, and I hope future generations will see the magic of these essential industries – appreciating the primal delight in getting your hands dirty. Brian Barrett and I shook hands on it. Brian’s furnace with the crucible for molten iron at the ready. 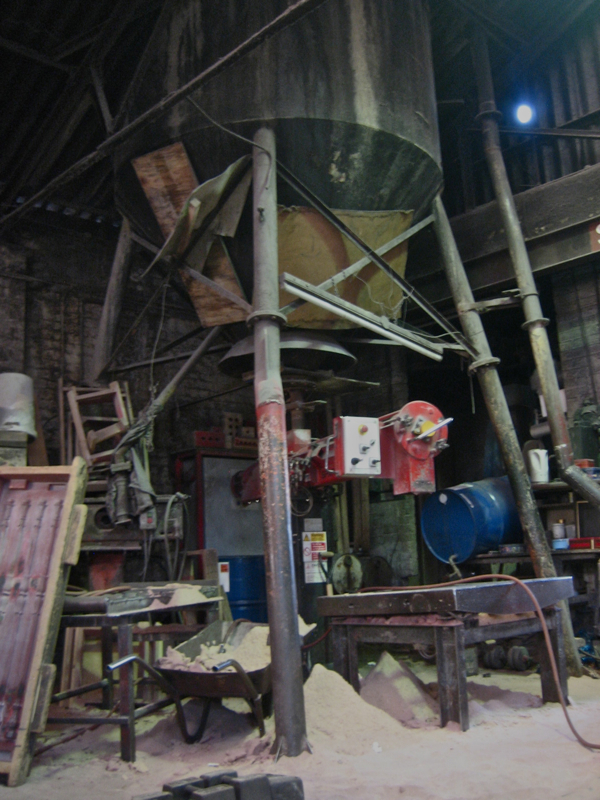 The computerised sand pump mixes beach sand with hardeners and resin to make moulds. The shop blaster where new castings are tumbled amongst steel shot. A fraction of the patterns in stock. 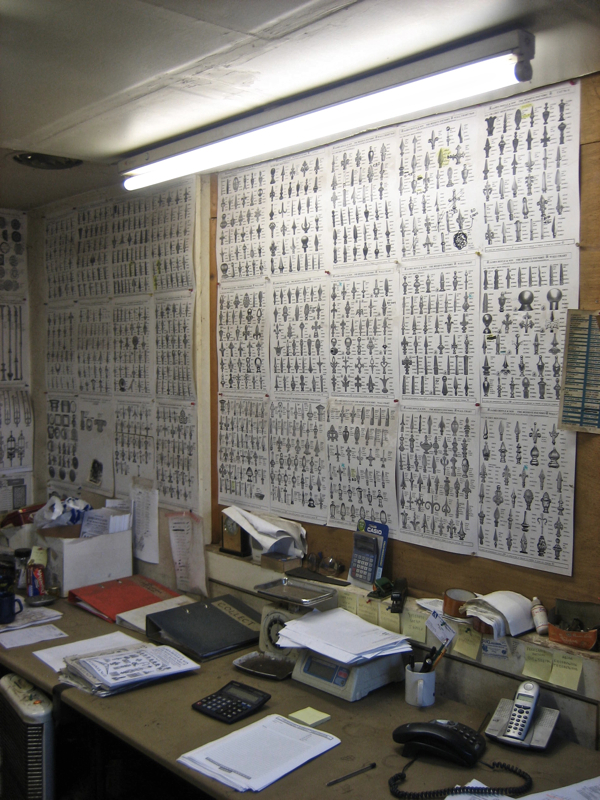 Pages of the pattern book adorn the office walls. Brian opens a mould to take a look. 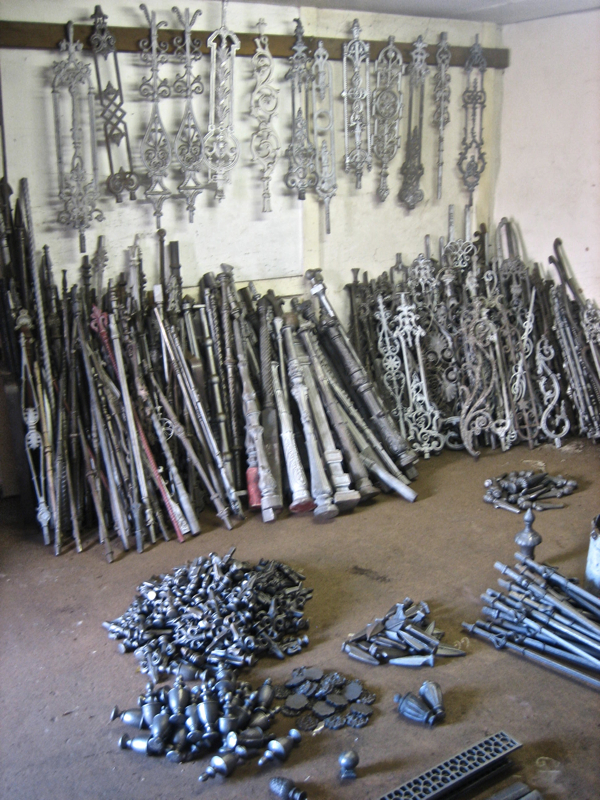 Absolutely fascinating – and your father apprenticed to a foundry as well. Nice to hear a few more details from the Gentle Author’s life. Beautiful photos as well; superb light. Sarah Ainslie’s or your own? PS My step-grandfather was apprenticed to a firm of engineers in Leicester and spent some of the happiest years of his life there. He welcomed his old apprentice ‘shop-mates’ back to a reunion at his own works annually for almost 50 years afterwards, such was the bond created. It’s good that the apprentice system is again being encouraged today. There is sadness you never went inside the foundry/foundries where your father worked. Did he refuse to take you or it just wasn’t done? Another great article, GA. I work on Andrews Road and was passing the foundry when Hackney Council were putting up the security cordon, fences, barbaric spikes and enormous remote controlled gates to protect, not a nuclear power station or air force facility, but the new parking pound! Foundry staff were all out in the street lamenting the change to the character of that part of the street. 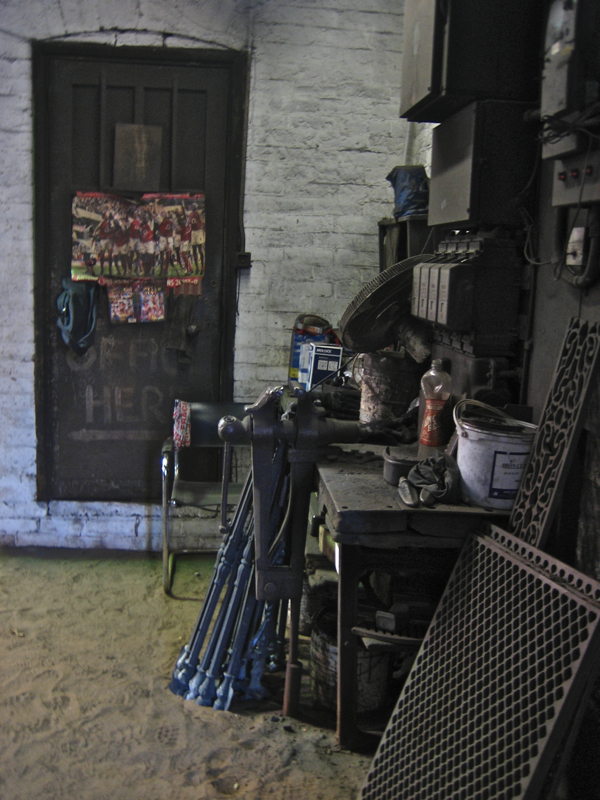 There’s a very familiar ‘feel’ about the workshop environment you’ve depicted as we used to have our own locksmiths workshop. It was of course very much smaller, but nonetheless I can sense through your words and pictures the same magical aura which surrounds such collections of craftsmanship. Great, thanks a lot GA: I’ve burnt me chips AGAIN! I love Brian’s boots. Really cool. GA, you have touched my heart. My father’s family were iron founders in the nineteenth century, and the men in the family worked with metal from the 1830s to the 1990s. 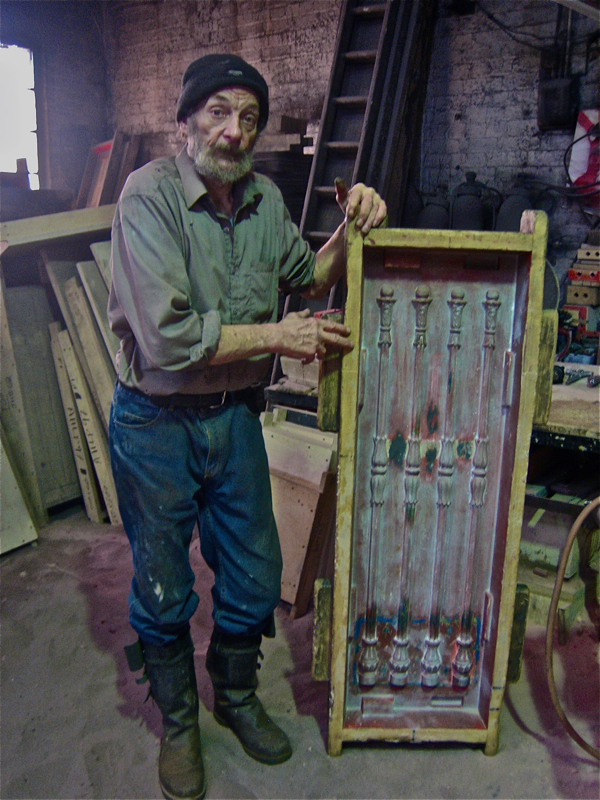 My father measured a man by the oil on his fingertips and callouses on his hands. It wasn’t until I began to know more of Swansea’s copper industry, the industry in which my family were later employed, that I began to understood why my father reserved his greatest respect for the men with whom he worked, men whose hands bore the scars of their craft. Gentle author, like you I am immensely proud that my father undertook his apprenticehip – the fifth generation of his family to do so. Your writing brings the magic to life. Thank you. Thank you so much for writing such a great piece and the photos are super. My husbands ancestor was Sarah Ann Banham who married James Hoyle in 1872. All these past years my husband, who works in property in London, has admired and loved the work of the iron founders. To find out he had a connection to such a great factory made his day!